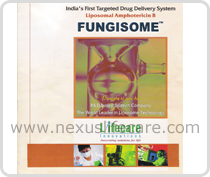 Uses:- Fungisome Injection is an antibiotic, prescribed for life-threatening fungal infections often used intravenously. Fungisome Injection is also effective in treating leishmaniasis. It is often used in patients who cannot tolerate or who do not respond to the regular amphotericin treatment. Fungisome Injection works by stopping the growth of fungi. Side Effects:- Chills, flushing, loss of appetite, dizziness, nausea, vomiting, headache or fast breathing may occur 1 to 2 hours after the infusion is started.